The membership committee is responsible for the major membership work of the association and for the coordination of membership activities. Committee Chair: William Marchione wmarchione@mscaonline.org BIO: Mr. Marchione began his career in school counseling ten years ago and currently serves as a high school counselor at McDonough High School in Pomfret, MD. Previously, he was the lead counselor at Piccowaxen Middle School in Newburg, Maryland. 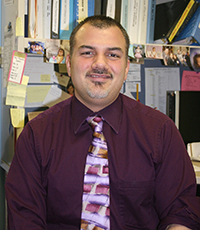 Mr. Marchione received his Masters in School Counseling in 2007 from Long Island University in New York State. Before starting his school counseling career, Mr. Marchione was employed as a Web Administrator for several years where he learned the skills needed to run a website. Though he enjoyed his job, it was not his passion. In School Counseling, Mr. Marchione found his passion. In 2011 Mr. Marchione became a Nationally Certified School Counselor and he was honored to be named Maryland School Counselor of the Year in 2013.